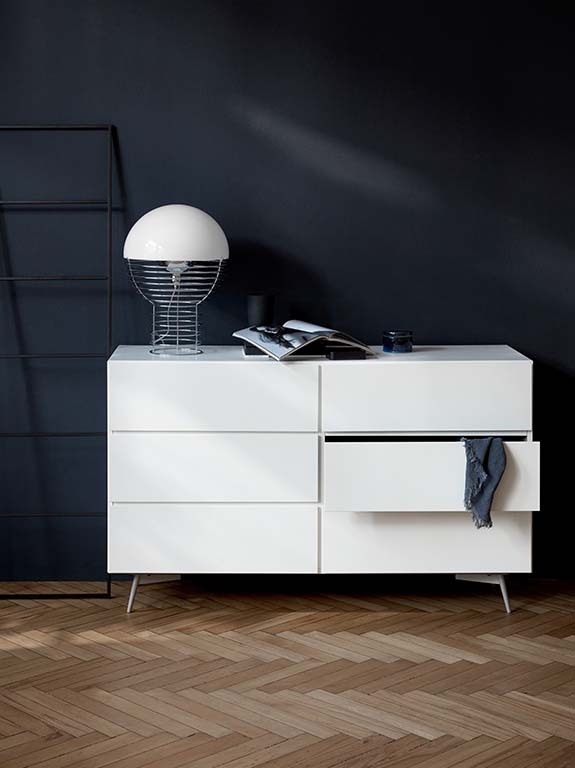 The Lugano dresser by BoConcept features an elegant design with crafty details. The Lugano is a perfect piece for the bedroom. Whether you are looking for just a small chest to store simple accessories such as towels and bathroom products, or something bigger to store your clothes and other appliances for your bedroom or living area, the Lugano chest is perfect for your home. It can be customised through a range of stunning colours and different size combinations to suit your personal needs. You can style the Lugano chest of drawers much like a sideboard, by placing stylish accessories on top, or even something more meaningful such as family portraits. The Lugano chest of drawers is not just limited to the bedroom, as it is high in practicality, it can also be used in other rooms around your home such as the living room or even the home office. You are not limited to just one style or shape, as the Lugano can be customised to your particular taste and style. Match this beautiful Danish piece with a modern bed from our contemporary range. Looking for more stylish bedroom furniture to complete your bedroom? Shop through our modern bedroom furniture range and turn your dream bedroom turn into a reality.